How often do you find yourself idling your car in drive-thrus, parking lots or right outside your child’s school? It’s probably a lot more than you care to admit, especially given how bad all of that unnecessary idling is for our air. Idling vehicles emit 20 times more pollution than a car traveling at 30 mph. 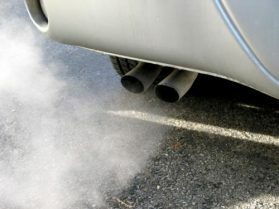 And the pollution released from vehicle idling includes air toxics, which are known to cause cancer, respiratory and reproductive issues, birth defects or other serious health concerns. Turning off your ignition when you have to wait for more than 10 seconds. Idling for just 10 seconds wastes more gas than restarting the engine. Not “warming up” your vehicle. Modern engines don’t need more than a few seconds of idle time before they are safe to drive. Planning your trips to avoid construction zones and traffic tie-ups. Resources like MoDOT’s Gateway Guide website at www.gatewayguide.com can alert you to high-traffic areas before you leave the house, allowing you to choose an alternate, idle-free route. For every 10 minutes your engine is off, you’ll prevent one pound of carbon dioxide from being released into our air – helping individuals across the region breathe easier. And with statistics noting that 10 minutes of idling a day wastes 27 gallons of fuel a year, choosing not to idle is also a great way to save fuel and money.